Why are my feet cut off in my print? Why does this look more close up than the original? Why is my 11×14 different from my 8×10? Remember the algebra you said you would never use? Well, it’s back!. When you print a photo, the part of your image that will be printed depends on the size of paper itself because of ratios. If your paper is square and your photo is rectangular, some of the photo is going to be lost. Simply put, only the part of the image that fits on the photo paper can be seen when a picture is printed. For example, most digital cameras take pictures in a 2:3 (2 to 3) ratio. That means that if one side of the picture is 2 inches, the other side will be 3 inches. When you increase one side, the other will increase proportionally (yikes! Algebra!). See the example of the sweet fishing baby. The original photo was shot in a 2:3 ratio. If you print a 4×6, the entire image will remain on the paper. However, if you choose to blow the picture up to an 8×10, the ratio changes to 4:5. Part of the image will not fit on the 8×10 print paper (see the bluish lines). You actually cut off part of the little guy’s hand. Ouch! Similarly, a 5:7 ratio is not the same as the original, so the yellow lines show how much of the picture is lost in that ratio. For some photos, it is not a big deal. 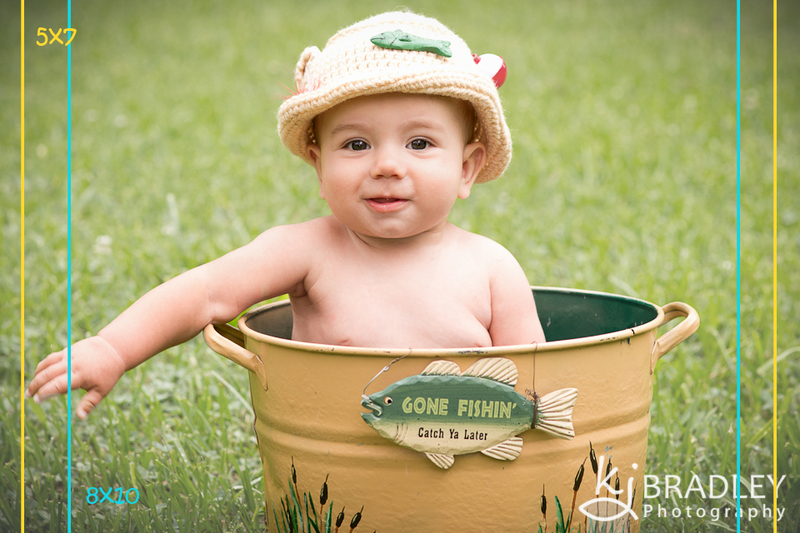 For others (like the gone fishing baby), cropping can result in a loss of an important piece of the photo. In that case, you would be fair better by printing the photo as an 8×12 rather than an 8×10 because the 8×12 maintains the 2:3 ratio. None of the image will be lost, but finding a frame may be a challenge. 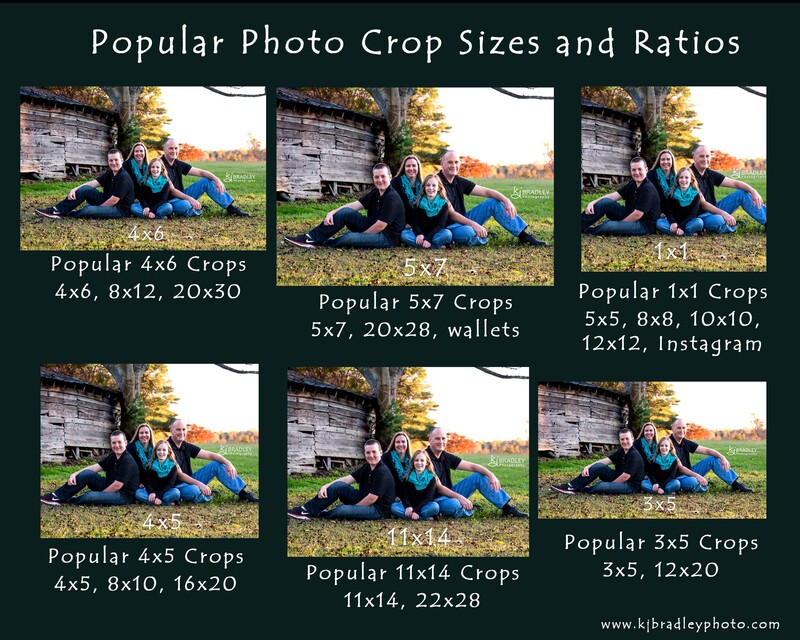 Below are some examples of how the same picture will look with different crop ratios and the popular print sizes that match each ratio. Remember, the pictures produced by your digital camera will be like the 4×6 example. Notice that when you choose a more square crop like the 4×5 (that’s the same as an 8×10), the tips of the shoes are lost. Crop ratios make a difference online as well. The profile picture on facebook and the pictures on Instagram use a 1:1 or square ratio. The cover photo on your facebook profile is a much more narrow rectangle. When in doubt consult with your photographer for a recommendation about the best ratio for your masterpiece.